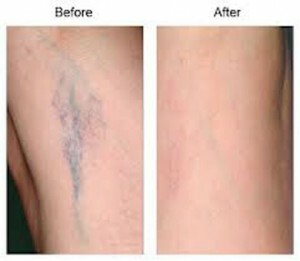 Sclerotherapy is used to treat the varicose, or spider veins, that are problematic. It is a medical procedure that works well for most patients that receive it. It has been used since the 1930s and it is a well-proven procedure. It will take about 3-6 weeks for you to notice a difference in the smaller veins. Metropolitan Vein and Aesthetic Center specializes in Sclerotherapy. Sclerotherapy is performed in a doctor’s office. The first thing we will do is clean the area. From there, a solution is injected directly into your blood vessel. The needles used are very fine, and should only provide minimal discomfort for you. The solution that is injected will irritate the lining of the vein, which causes the walls to swell and stick together, eventually turning into scar tissue. It then fades from view after some time, eliminating the appearance of the vessel alltogether. Along with improving the appearance of spider veins, you can also expect to be able to return to normal activities the same day and exercise within 1-2 days. In general Sclerotherapy is the most effective therapy for spider veins and has been shown to be much more effective than laser in clinical trials. Sclerotherapy can help you regain your confidence and allow you the freedom of showing off your legs again to the world. Enjoy the freedom of showing off your legs.